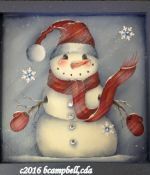 The Light of Christmas is a wonderful and soft design to paint for the holidays. A wonderful present for someone special or love it so much, you keep it for yourself. 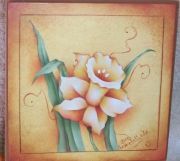 This is the 4th floral in my “summer floral” series and all of the designs are painted on the same surface. A light an airy pink floral to go with the morning glories, blue hydrangeas and the pink rose. 3 soft white candles on a tray surrounded by holly leaves and holly berries. 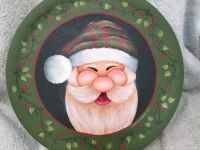 This tray can be used for the holidays as well as on into the New Year. 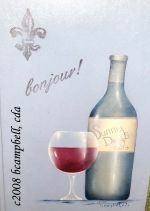 This design is for the true wine "officanado". Painted on actual book with a title befitting the design. A beautiful addition to any coffee table. Christmas Cookie Tray - A wonderful design to display those wonderful homemade cookies for the holidays. Keep for yourself or give as beautiful gift for someone else.